Mysteryland, the sister festival to TomorrowWorld, is heading to the US! The festival will be held on Memorial Day Weekend 2014 in Bethel Woods, NY, the original site of the 1969 Woodstock Festival. No festival has been held here since 1969 and to some it is surprising that Mysterland, an electronic music festival, would be the first multi-day festival permitted on this site. The festival will be marking the 45th anniversary of Woodstock, so it is sure to be a special occasion. Selecting Mysterland as the first festival was no hasty decision made by Bethel Woods. Mysteryland has a lot of credentials behind it. Mysteryland, in fact, is the “longest running electronic music festival” and was first held in 1993. Therefore, the event this summer will mark two special occasion: the 45th anniversary of Woodstock and the 20th birthday of Mysteryland (plus, it will be the unofficial start of summer!). This will also be an exciting time because this will be the first time Mysteryland will be held in the US; thus far, its roots have been in the Netherlands and Chile. Tomorrowland was actually a “spin off” of Mysteryland (though it has developed its own cult following) and it’s US twin, TomorrowWorld, had a successful first year in the US in September (check out our review of the festival here). 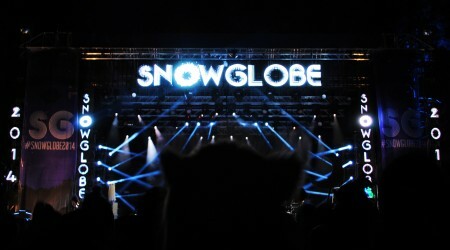 Both festivals are backed by the EDM powerhouse, ID&T, the company that also is behind Sensation, which similarly hit the US in recent years and has been a great success. According to Darlene Fedun, CEO of Bethel Woods Centre for the Arts, “We chose ID&T’s Mysteryland brand as the first modern era festival on the hallowed grounds for its belief in many of the same principles as our own organization. Creativity, unity, social responsibility and a focus on the “experience” of the guest.” For anyone who has ever attended either Tomorrowland, TomorrowWorld, or Mysteryland, you will definitely agree that these truly are the core tenants of these festivals and the masterminds who put on these festivals work hard to keep to these values. Tickets will go on sale December 12, 2013 at 10am at special, ultra discounted holiday prices (which was not done for TomorrowWorld, so this is great news!). There will also be a pre-sale for people who sing up for their newsletter. See below for more details and sign up here to get pre-sale tickets! After holiday priced tickets sell out, there will then be early bird ticket available. Prices after early birds sell out have not been released yet. **Please note: Just like TomorrowWorld, Mysteryland is a 21+ event! Nomad Weekend & Holy Ground Camping: aptly named “Holy Ground” after the nickname for the Bethel Woods site, Holy Ground will be the camping option (called “Dreamville” at TomorrowWorld). This allows you to arrive one day early to set up camp and that night there will be a warmup “party.” You then have access to the festival grounds until Monday, making the $75 price so worth it. Plus, what’s a real festival without camping? Please note: There will be limited camping space available! Mysteryland B’N’B: Similar-ish to TomorrowWorld’s Easy Tents! This is for the people who want to go all out and stay on site every night. The organic breakfast is a nice, unique touch! Lander’s River Camping: Off-site camping option is slightly cheaper and includes weekend tickets. The campsite is actually a pretty popular campsite located on the Delaware River– sounds pretty awesome! Plus the free shuttle to and from the festival is a nice touch. However, you will miss out on the nice perks of on-site camping, such as running back to your tent to grab that hula hoop you want to use now or grabbing a hoodie when it gets chilly out. Since there will be limited Holy Ground camping space available, you may have to default to this option if you’re determined to still camp! 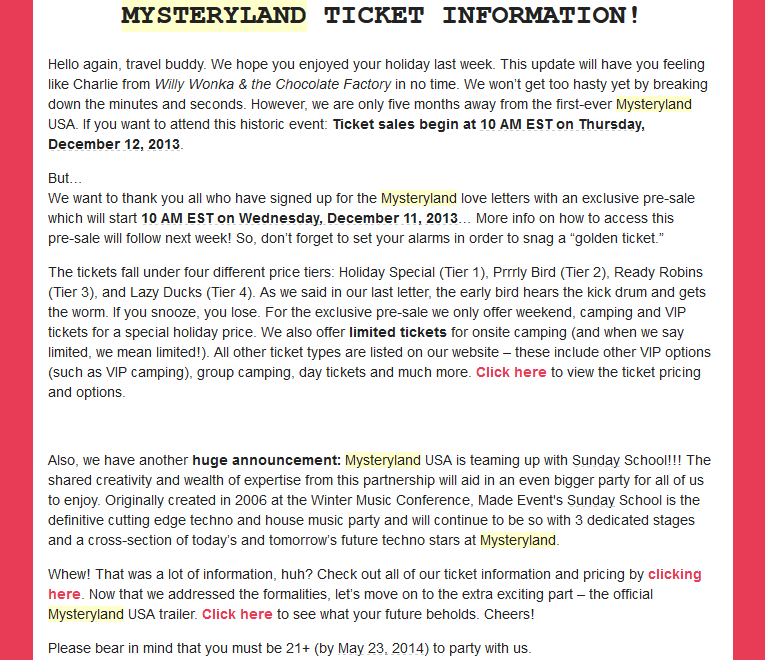 If you have signed up for the Mysteryland newsletter, check your inbox! You will have received the following letter, which informs you that you will have exclusive pre-sale access to ticket sales starting December 11 at 10am! Not registered? Simply sign up for pre-sale here!